In October 2007 Japan turned on the first publicly available nationwide earthquake early warning system. On March 11, 2011 it had its first true test during the M9 Tohoku earthquake off the coast of Sendai. The system issued a warning before the S-wave arrived onshore, a great achievement for the seismological community in Japan. This page compiles information on the performance of the warning system and how it was used. As California continues testing of its prototype system, there is much to be learned from Japan. This page is compiled by Richard Allen at UC Berkeley. Please email information/links etc about the performance of the early warning system to rallen-at-berkeley.edu. Learn more about the ongoing testing of a warning system for California on the ElarmS pages. Video showing the live TV broadcast during the earthquake. It shows the automatic earthquake and tsunami warnings that appear on all TV screens and has a translation. Note that the broadcast is live coverage of a parliamentary session in Tokyo. They do not have the warning in the session and so do not react until they start to feel light shaking around 55 sec into the video. The TV broadcast then cuts to a live announcement just before the strong shaking starts. "Our meeting was being held on the second floor of an office building near Sendai Station. Suddenly, during our discussions, our mobile phones began to ring with the distinctive earthquake alarm. ... This gave us a window of a few seconds to prepare before the shaking began. My business partner and I took shelter on the floor beneath a steel door frame and waited for the shaking to begin. Although the building we were in was fairly new, the shaking was strong enough that we were not able to stand. Dust and debris from the ceiling began to fall like snow and large cracks appeared in the walls." Just after 2:46 p.m. on Friday, March 11, an earthquake warning buzzed on the cell phone belonging to Professor Kensuke Watanabe. He knew it was time for everyone in his class to bolt under their desks. The university building in Sendai, the biggest city hit by the quake and subsequent tsunami, began to shake violently. But Watanabe and his students, with that small warning, were able to use the sturdy desks as protection against falling objects. Shortly after, they fled the building for open ground. None in the group was hurt by Japan's worst earthquake on record. "It was terrifying," says Watanabe, "but the mobile warning really helped." This person could have used a few seconds warning to duck, cover and hold on. Note that he shows the tsunamic warning on his computer towards the end of the video, but he does not have the earthquake warning software installed. Map right: shows the amount to warning time when the first warning was issued. The contours are time until the S-wave arrival in seconds. The region within the 0 sec contour is the blind zone where no warning is available. The figure shows that the warning was issued before the S-wave reached the coastline. Table below: shows the realtime estimates of the earthquake source parameters and the maximum shaking intensity generated by the warning system. The warning was issued at update number 4, 8.6 seconds after the first P-wave detection. Table notes. The first P-wave detection was at 14:46:40.2. All times are JST on March 11, 2011. The user is in Sendai (the closest major city) so the countdown is until the S-wave arrival in Sendai. The radiating circles are the P-wave (blue) which does little damage while providing the information upon which the warning is based, and the S-wave (red) representing the onset of strong shaking. This comes from the Real-time Earthquake Information Consortium. You can see many more warnings for other earthquake on their YouTube channel. Publically operated NHK (upper right - see subtitled video above) provides the warning, but the other commercial stations do not show warnings until much later. Seconds Before the Big One: Progress in Earthquake Alarms Earthquake detection systems can sound the alarm in the moments before a big tremor strikes-time enough to save lives by Richard Allen, Scientific American. The USGS NEIC event page. The USGS event summary poster is available here. The Univeristy of Tokyo event information page. 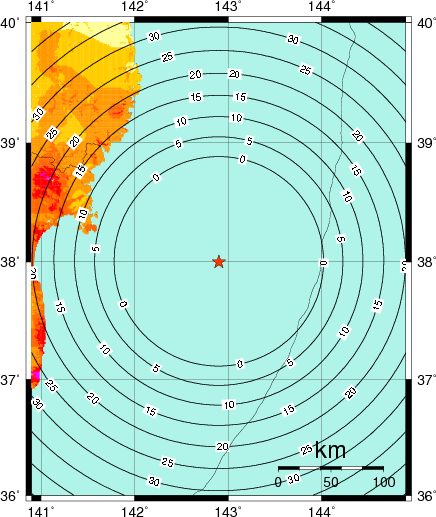 The JMA ShakeMap for the earthquake.